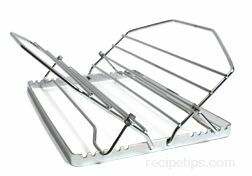 A formed metal rack that is placed in the bottom of a roasting pan in order to keep foods raised above the bottom of the pan. The rack allows excess fat to drain from the food (especially meat) and it helps prevent the bottom of the food from burning or scorching. It also allows the food to cook evenly on all sides. 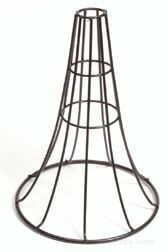 Specially formed racks, such as the poultry racks and the v-shaped meat racks can also be used on the grill for the same intended purpose as when used in the oven. They will help the meat hold its shape and allow it to cook more evenly. Roasting racks are formed into different shapes and sizes to hold various types of meats, poultry, fish, and other foods. As an example, different shaped or sized roasting racks are made for ribs, roasts, chicken, game hens, vegetables, and various other foods.